Donkey Kong Country Returns was released on November 21, 2010 at a MSRP of $49.99. The game was developed by Retro Studios, and published by Nintendo. It received an ESRB rating of "Everyone", with "Mild Cartoon Violence" listed as content for parents and gamers to be aware of. 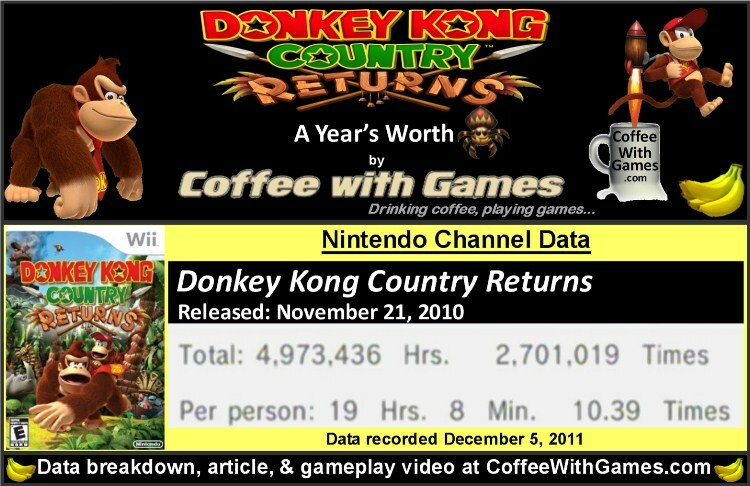 How many hours have Wii owners spent hoarding bananas over the last year in Donkey Kong Country Returns? Let's take a look! 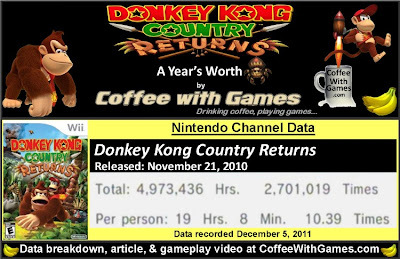 Donkey Kong Country Returns now has 259,963 Wii owners that have reported data through the Nintendo Channel with 372 days possibly reported. The game has seen approximately 249,460 more Wii owners report data through the Nintendo Channel, compared to the number on its debut from December last year. DKCR has almost 5 million "Total Hours" of gameplay reported in just over a year, and the game's average play-time per day/session is now 1 Hour 50 Minutes. DKCR's "professional" review score average is now 87.79%, based on 53 reviews on GameRankings.com. The game still has 4.5 out of 5 Stars rating on Amazon.com, but now it is based on 306 customer reviews. Mrs. Coffee and I beat Donkey Kong Country Returns together earlier this year, but we haven't really played it since. As a matter of fact, it is not currently in our game "collection", as we traded our neighbors it back in July in exchange for Kirby's Epic Yarn and Wii Sports Resort. Before we traded off Donkey Kong Country Returns though, how many hours did we put into the game? Our 65 hours reported are nearly all of just the two of us playing through the game together, with maybe an hour or two of the total being from us playing our own files in the game. If you have played Donkey Kong Country Returns cooperatively, you can probably relate to the frustration from the infuriatingly awesome level designs when trying to survive through a level with another player. Donkey Kong Country Returns' first year of reported data places it behind Mario's games, but ahead of Kirby. Seeing the play-time that Mrs. Coffee and I reported, over 60 hours, compared to the average reported on the Nintendo Channel being under 20 hours, is really surprising to me. It makes me wonder if perhaps Donkey Kong Country Returns is so much of a challenge, that many of the players aren't finishing it? I think DKCR is an excellent Wii game, and an excellent cooperative 2D side-scrolling platforming title in general. I really hope that Nintendo announces very soon Donkey Kong Country Returns is becoming a Nintendo Selects title so many more Wii owners can experience it. If you are looking for a new Wii game for Christmas that you can play with just one other person locally, I can recommend Donkey Kong Country Returns. Have any of you recently acquired and/or been playing through Donkey Kong Country Returns? If so, have any of you completed the game 100% cooperatively and, have you or anybody know you completed everything in the game, "Time Trials" and all? If you don't own Donkey Kong Country Returns is it on your Christmas list, or would you purchase it almost immediately if it became a Nintendo Selects title with a MSRP of only $19.99? Beating the final boss alone was quite challenging. There was a rocket barrel part beforehand, and if you died at the boss, you had to start from the boss but with Donkey Kong only! Great game. Was the runner-up for Wii GotY last year on SPC. Additionally, I believe this month is the 30th anniversary of Donkey Kong. I actually cheated a bit on the last two bosses. If you connect a second remote and play two player, you always start with Diddy when you die. When you carry him on your back, you keep him for 3 hits instead of 2, since the damage alternates between DK and Diddy for two player. I got 100% in the game and immediately started playing mirror mode from the end levels backwards. I also did some time trials shootin' for shiny gold medals. I believe that the first level of the second world is the hardest one in the game. I got stumped there and switched over to some of my backlog games. Its nice to know I still have a good challenge waiting for me when I return to this game though. I love how Retro Studios made this one of the best DK games ever. Its hard yet so rewarding. Although game has 4.5 out of 5 rating but as i know that my friends who bought it doesn't happy with that the game but I wanna go for my experience so I will try it for my Christmas. "Beating the final boss alone was quite challenging. There was a rocket barrel part beforehand, and if you died at the boss, you had to start from the boss but with Donkey Kong only!" I remember the final boss, and the part you're talking about. The one thing I don't remember is having to start with only Donkey Kong, though we may have completed it our first try...I can't remember now! "Additionally, I believe this month is the 30th anniversary of Donkey Kong." Yea, I saw some messages about it on the FB page. "I actually cheated a bit on the last two bosses. If you connect a second remote and play two player, you always start with Diddy when you die." No help from your little one? "I got 100% in the game and immediately started playing mirror mode from the end levels backwards. I also did some time trials shootin' for shiny gold medals." I played through I think two levels in Mirror Mode. The one gripe I had with Time Trials was that you couldn't do them cooperatively, and there wasn't a cooperative Time Trials option. I still haven't beat New Super Mario Bros. Wii, Kirby's Epic Yarn, or this one by myself, because Mrs. Coffee and I played through them together and I didn't go back to them afterwards. The game can be challenging, but it does have the "help" feature like New Super Mario Bros. Wii if you get stuck/die too many times. I hope that Retro has a team developing DKCR2 for the Wii U, even the Wii...don't really care, just as long as they deliver another one. Have you finished all the main levels, or still have some to complete? Thank you all for the comments/feedback, I appreciate it! i'm addicted... my kids, not soo much.. it's a little on the difficult side for them.. though, i see them revisiting it again in the future. This looks like a great game, but the price always seems to be pretty high. 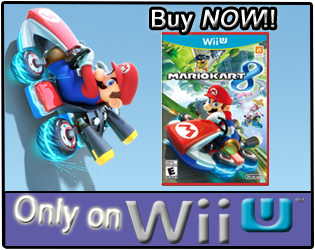 (despite probably being worth $49) I'd definitely consider it at $19 once I get back to purchasing Wii games again. I aquired DKCR as a present for Christmas about a year ago. 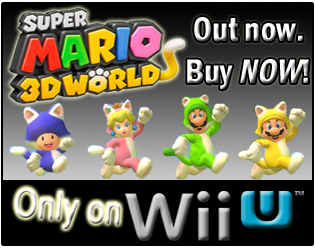 It's a great platformer and the mix with the 2D/3D is great. This is definatly one of the Wii's better games. Firstly when I saw the title the first thing came in my mind is that this remind me about the 64 in 1 video games in which this game is there with three different levels 1,2,3 but I have not played this PC or any other console I love to play this on Nintendo Wii U which is coming with different new modifications.